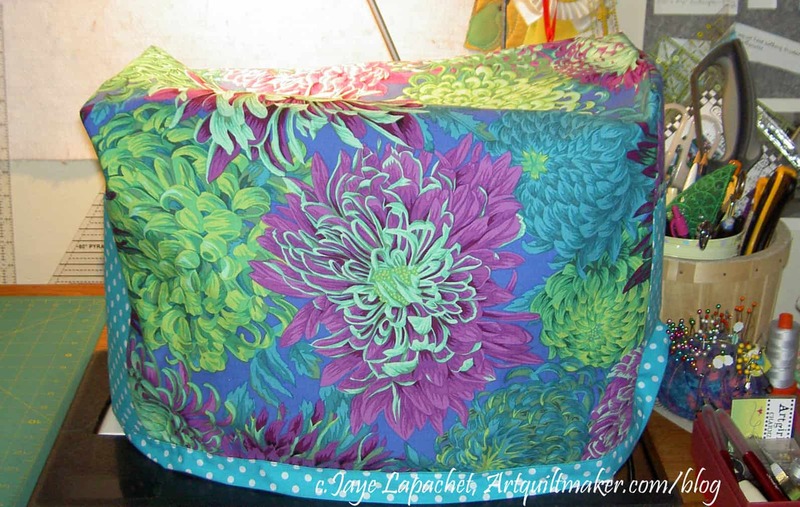 On Instagram, @Lillyellasworld has a sew-a-long happening for the Undercover Maker’s Mat. The pattern is free. People have made the whole mat and they are showing some great versions of this pattern. I also saw one with a heart instead of a butterfly. Despite the foundation piecing, I am thinking of making one for retreats. I can’t see using it at home, but it would be really useful to keep everything organized while I am away. As a result, I was thinking about sewing machine mats in general. Before I madethe Undercover Maker’s Mat, I wanted to see what else what out there. As I am wont to do, I did an image search. I found a lot. Still, after sifting through the duplicates, I found a few that were interesting. 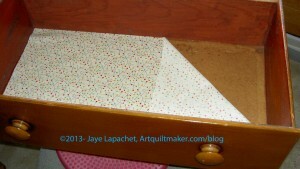 I know you are wondering about the Crafty Gemini Sewing Machine Table Mat & Organizer. I made it (and am not showing it to you yet, because it will be a gift, so stay tuned) and am not super happy with it. I didn’t do a crappy job and it isn’t ugly, but it isn’t for me. It’s possible I won’t like the Undercover Maker’s Mat either in which case I will try one of the other free tutorials that are available. One that was interesting was a tutorial from Michelle of Creatively Blonde. I like the way it looks tailored and hangs down in the front of the machine. 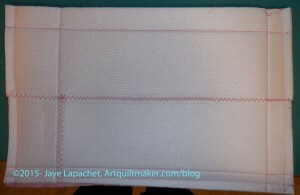 I also like the way the We All Sew tutorial has a long length. I also like the rainbow. Katie from Katie’s Quilting Corner has a tutorial that clearly shows how to customize the tutorial for the size of your sewing machine. The thing that is great about the Crafty Mummy pattern is the scissor loop. 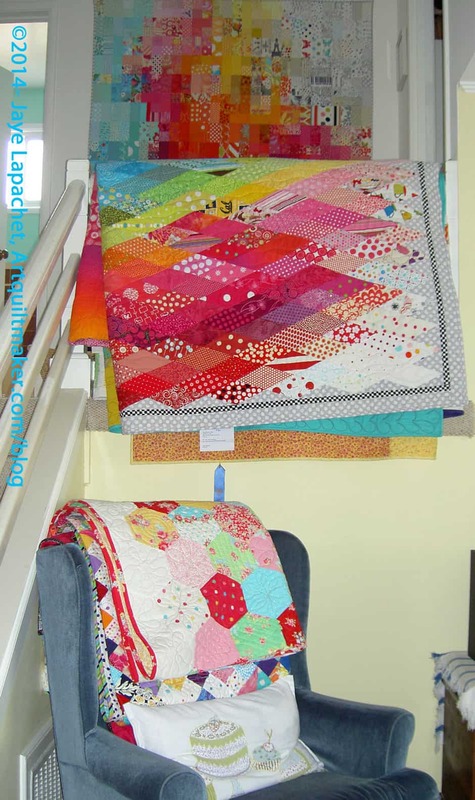 I like the pattern in issue 35 of Love Patchwork & Quilting – free pattern not available. I like the way the front hangs down. I don’t know that I would put all vinyl in the front, but I know why the vinyl is used. And then, I found that someone did a list of table mats already. 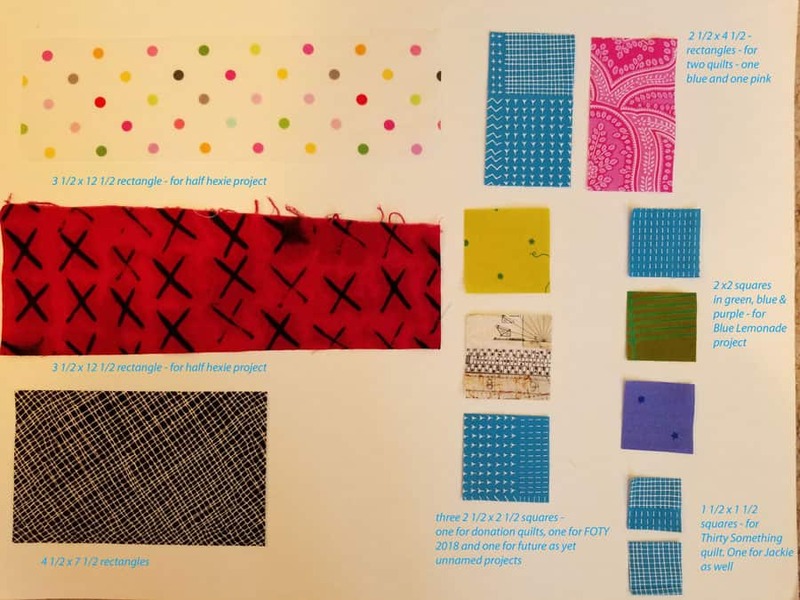 The other day I wrote about using the Accuquilt to cut up some scraps. 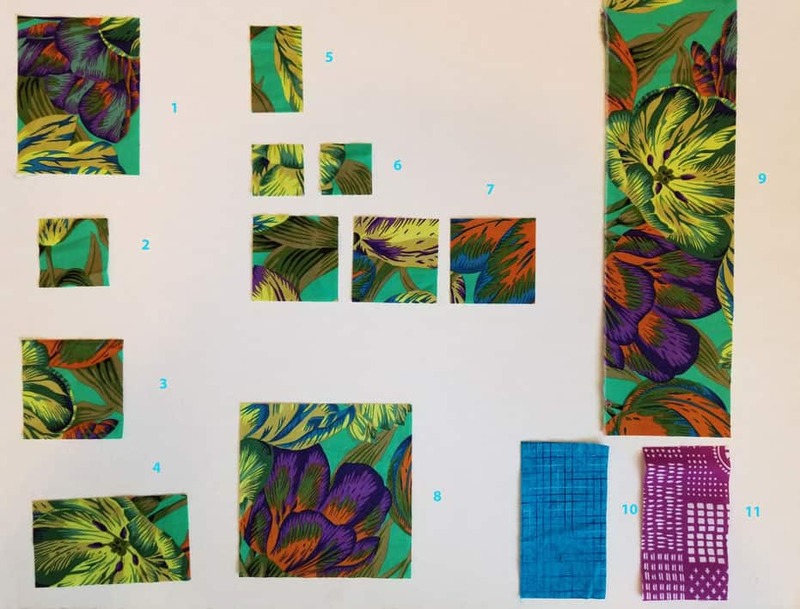 SherriD asked me some questions about the Accuquilt and it made me realize I had never really articulated how I use my Accuquilt. Perhaps I have and I just can’t find it in the blog? 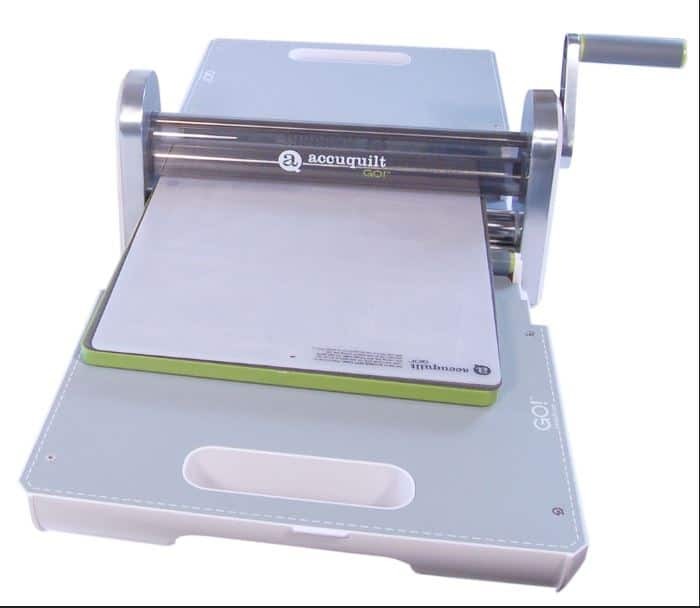 I bought the Accuquilt on sale in order to cut about 10,000 strips for the Renewed Jelly Roll Race quilt. I felt like it was an indulgent purchase, but also somewhat pragmatic. It worked really well for that type of cutting (as long as I was able to straighten the fabric accurately). I don’t have a large cutting table so cutting long strips can be a nightmare of folding. The Accuquilt works really well for this purpose. I determined, early on in my Accuquilt ownership, that I was not going buy every die. I also did not plan to buy the applique’ dies. 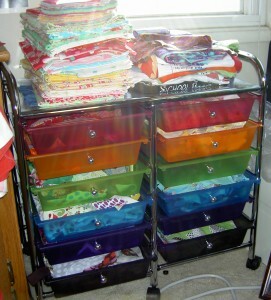 I don’t do much applique’ and I saw no reason to clutter up my shrinking fabric closet with dies I would never use. Having a complete collection is not important to me. I also decided I would buy basic dies – squares and strips. I want dies that give me as many options as possible, so I buy sizes of squares, mostly, that I can use in various quilts. 2.5 inch squares is the die I use the most for ‘on spec’ cutting. 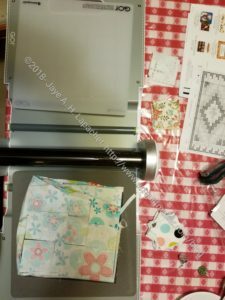 I also use the 2 inch die as I am still collecting blue, green and purple squares for the Blueberry Lemonade quilt I plan to make at some point. I have branched out a little. I have an HRT die. Never used, but I have it. It is a great example of why I try to be careful about the dies I buy. I bought it thinking I could pair it with 2.5 inch square a la the Spiky Stars quilt. It isn’t the right size. That is an obvious drawback for dies. With rulers, you can cut whatever size you need. The dies are usually limited to one size. I have seen dies with multiple shapes or sizes, but that isn’t always the case. I often use SIL’s Peaky & Spike die, so much so that I have thought of buying my own. Up until now using hers is fine. She and I coordinate die buying now that we live near each other. That expands both of our collections. Triangles are a pain to cut, so I either use the Triangle Technique or some other quick cutting method. 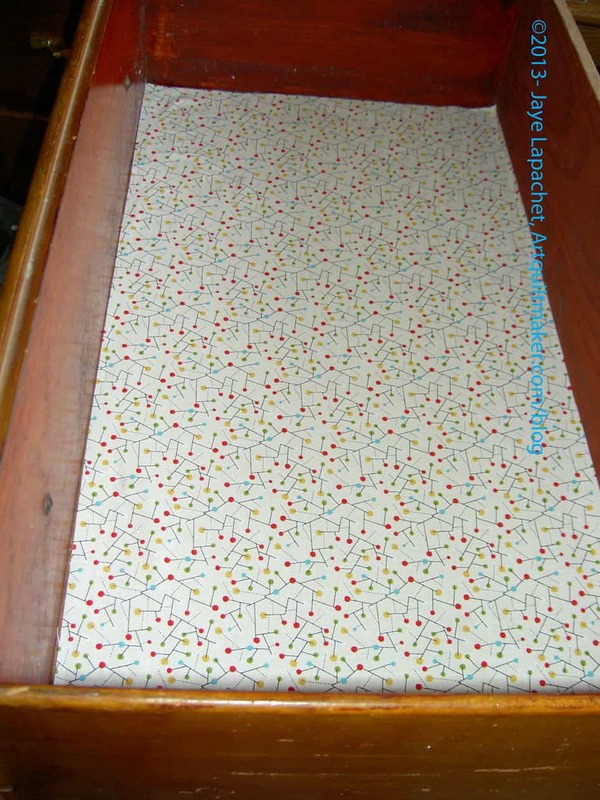 Triangles are great to cut with the Accuquilt, but I haven’t invested in the dies. I have a few, I think, but I find they often aren’t the right size for my project. I probably would have bought the electric version if it had been available when I was shopping. 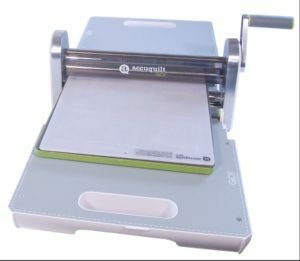 If you are thinking of a die cutter, see if a local shop has one they rent. Some shops do and that can be a good way to try them out. The bottomline is that there is no one way for me to cut. I use rulers, dies, templates and whatever else works for my project. Do what works for you. I am in a little bit of a quiltmaking funk at the moment. Not sure why except work is taking a lot of brainpower. One of the results of these feelings is that I tidy. You saw the column quilt I posted the other day. That was the result of leftover pieces and blocks. At Craft Night on Monday, I brought down a drawer full of scraps and cut them up with my Accuquilt. I made it through the whole, mostly white, drawer and came up with, perhaps, 80-100 2.5 inch squares. I’ll have a good supply for donation block backgrounds. A few weeks ago, I mentioned that I had bought some project boxes. 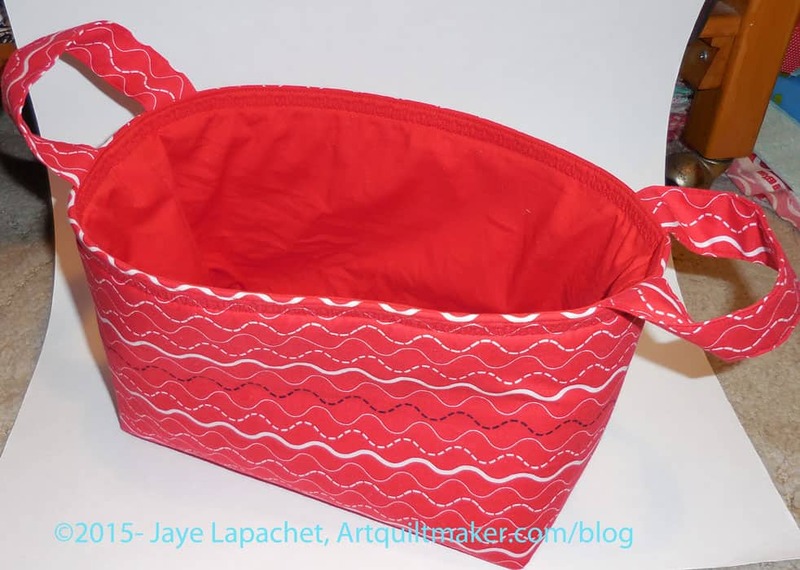 I have few boxes and baskets that I used for various things, mostly gathering fabrics together for various reasons that I often quickly forget. I hadn’t really used project boxes before. After I brought the boxes home, I actually did put projects in them almost immediately. While this is a teetering stack, it actually works a lot better than the stack of fabrics I was using before. First, all the stuff for a project is all together. 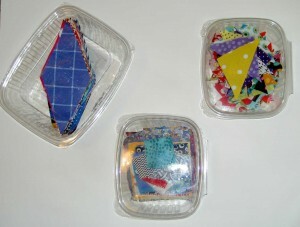 I can even put smaller trays of cut pieces inside the larger boxes. Second, they are much easier to move. I pick up one or two, put them aside and then the step stool is usable again. Finally, I don’t have to hunt around for materials. All the materials are in one place (3 might be the same as 1, but they are different in my mind). After I got the larger boxes organized, I cleaned out the smaller boxes and re-purposed them to organizing projects as well. The small box with the handle has all of my Crafty Gemini Organizer Club supplies in it except for that fusible foam stuff, which doesn’t fit. It would fit in one of the larger bins, but all I had was the smaller one. Needs must. Two bins have fabrics and such for the Stepping Stones n.2. That is a lot of organizer bin real estate devoted to one project, but scrappy projects will do that to you. I hope to finish that project soon (though I haven’t worked on it recently, so not sure how it will happen. All in all, I am pretty pleased with this solution. I need to sew more to get through projects, but that is a completely different issue. It has been awhile since I showed my cutting chart. It is something I meant to do in January, but it never seemed to get done. The previous post describes my process very well. I am still working on some of the same projects as I was the last time I showed my cutting chart, but others are off the chart and finished. I think the number of patches I am cutting seems very paltry, but at least I have some organization. I think I should add grey windmill pieces to the list, because I still don’t have enough for that project and I would like to get going on it. I didn’t think of it until now. 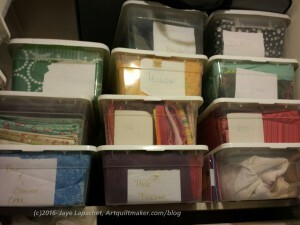 I am not sure I ever said, but I store most of my fabric, primarily, by color in plastic bins. Occasionally, I will put a special group of fabric together. 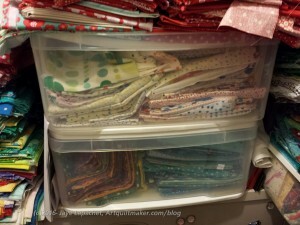 For example, I have some silk fabrics in one bin (bottom right). I can’t buy those bins anymore, which is too bad, because I like the flat tops, but in an ideal world I would have some other system where the fabric wasn’t confined like it is in the bins. I am grateful to have the bins, but if I need light blues, there is a lot of manhandling that has to happen before I can get that bin out. Some fabrics have spilled over to other parts of the closet, so I can’t just look in the orange bin if I want orange fabrics. I also have a drawer system, holds a lot of my dots. Not all, but a lot. TFQ helped me pick out this as well. I like it and it holds a lot. One issue I have is non-fabrics and non-patterns. I have pre-cuts waiting for me to make my intended project. I have blocks from the City Sampler project. I also have blocks from the quilt class with Frances. These are still a problem I haven’t resolved. I put them where I can find some space. This isn’t an ideal solution. The pictures in this post from 2008 make me sentimental for the good old days when this closet was clean. At least, I am continually removing fabric I no longer want to use for my own projects and making it into donation quilts or giving it to the guild. I am also paying more attention to fabric I buy so I don’t buy things that will end up in a donation quilt sometime. 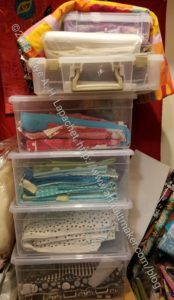 One of the posts I wrote talked about organizing projects in project boxes. I have a couple of project boxes like the ones pictured and I don’t use them for projects. I want to use them for projects, but they take up more space than file folders. In my current space, with the current furniture, etc, it isn’t possible. The ones I have I use for patterns, especially bag patterns. And they are full, which means that I have to start churning out bags. HA! We’ll see since I have two bags on my to do list and all of those patterns are bags on my ‘someday’ list. There are other patches as well such as 2.5″ squares (you just never know when you will need some), donation patches, random HSTs and others. I still use the scone boxes for hunting and gathering, though that trickle of new boxes has slowed. The company changed the cranberry orange scone recipe 🙁 and they just aren’t as good as they used to be. Not bad, but not worth the 360 calorie commitment. The scone boxes are a good size, but they have some issues. The rounded edges don’t poke me, which is not. They also don’t stack very well because of those rounded edges. Also, being disposable, the plastic is pretty thin and tends to break easily. Still since they come into the house filled with something rather than empty, they are economical. Of course, I probably shouldn’t stack them 8-10 high. Fortunately they don’t open and spew fabric patches everywhere when they do fall. One thing to think about would be not to have so much hunting and gathering going on all at once. I have a few miscellaneous plastic, former food containers as well. Good ones, for me, come from chocolate covered cherries and spinach. At some point, I plan to replace these with more stackable and sturdier boxes. There is a lot of other stuff to organize in my workroom, but it is all badly stored if adequately organized and I don’t want to show you photos. I really want better shelves or something for my books, embellishments, etc. I think I will be able to work better and get more day. Off to buy a lottery ticket! 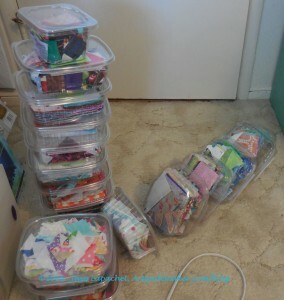 I was reading Pam’s recent Sunday Stash post after listening to her podcast and thinking that perhaps I should rethink my scrap storage. I bought a little drawer system some time ago, which works pretty well. Still, random sizes of scraps doesn’t work that well except for mosaic piecing. Piles of scraps shoved in a drawer are not fun. Pam and Bonnie Hunter cut their scraps into certain sizes. Pam has talked about the sizes she uses, which differ from Bonnie’s slightly. Bonnie calls her system the Scrap User’s System, which is a good moniker. I have just never embraced that method, because I never seem to have the right project for some of the sizes. And I don’t want to make projects just because I have certain sizes of patches. strips in sizes of 1.5″, 2″, 2.5″, 3″ and 3.5″. These are strips 12″ or longer. I do use the scraps from the actual scrap bin for various things. I sew my scraps using the mosaic piecing method to make journal covers and other small items. I also fill in weird places on the backs of quilts using scraps. 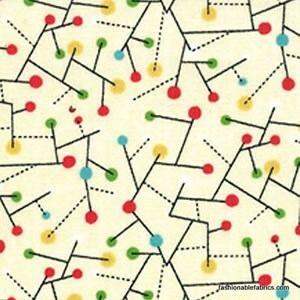 If I make a scrap quilt, I want it come out like Scrapitude in its cheerfulness and fun style. I do NOT use Bonnie Hunter’s method of just grabbing any color and using it. I want my quilts to look good and that means choosing pieces carefully. That is designing. I do believe in using up my fabric. I have a working collection and not just a collection so the above would make sense for fabrics that I like, but aren’t going to be used for a project. I wanted to make some progress on something. I felt like I wasn’t making progress on anything, so I got out my To Do list and looked up what I felt like doing. The first thing I did was make progress on the Pinkalicious Journal Cover. Once that project was well on its way, I made a second One Hour Basket. I don’t think it took me an hour, even if I subtract the time it took to sew pieces of Soft & Stable together. It didn’t take much longer, though. I was pleased to get something finished. I had some weird pieces of Soft & table leftover that were on the small and thin side. I decided I had enough to use as stabilizer for this pattern. I sewed them together much like I would sew a piece of Frankenbatting together. I was able to use most of the leftover S&S, which pleased me. The pattern is free on Craftsy, I think and the directions are fairly good. The weird part is that the pattern uses 3 different seam allowances for this one pattern. I think there is something off as the lining seems a bit baggy when the whole piece is finished. It is fine for my purposes, but if I were going to give it as a gift, I might use a slightly larger seam allowance for the lining. If I make more I’ll have to play around. I am pleased that I got something done and have something I can cross of my list. 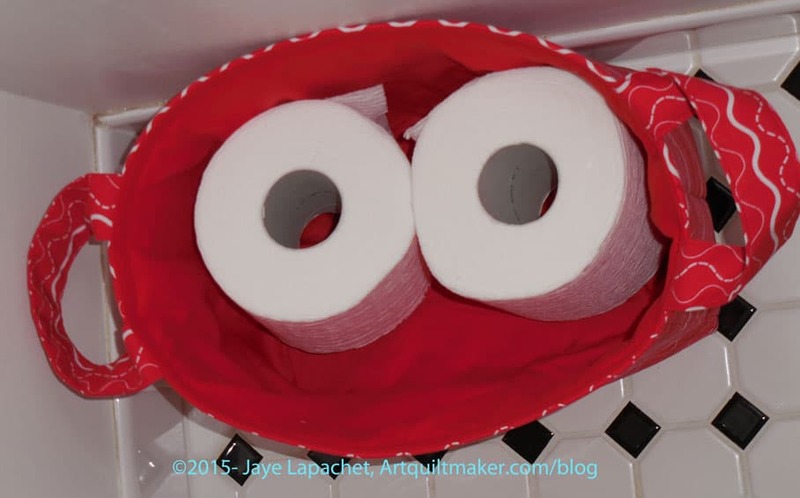 I finally made something in which to store the TP! Hooray! Only one, though, so I have another for the other bath off my to do list. This is not a difficult project and I am glad I made it when I did, which was at the end of a long day of sewing. It was a very satisfying day where I was basically getting stuff done that had been hanging around on my to do list for way too long. I needed less than a yard of fabric. The partial half yard worked fine for the exterior. 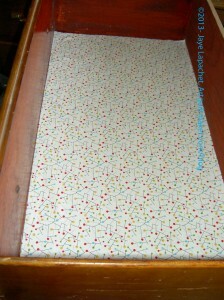 Since I used Soft and Stable I sewed a couple of lines of quilting to attach the fabric to the Soft and Stable. Also, I had to do a Franken-batting job to the Soft and Stable, because I only had small pieces and didn’t want to open my new package. I used a very large zigzag stitch to hold the parts together. Where you see the zigzag in the picture (left) is where I had to sew bits and pieces of the Soft & Stable together. I did a few lines of quilting since the pattern calls for fusible fleece and Soft & Stable isn’t fusible, just to keep the fabric attached. I don’t think it was really necessary, but it made me feel better. The one thing I couldn’t do was add some Vinyl Fuse to the bottom. I like to do this for bags to keep them clean. I only add the VinylFuse if I can also sew all the sides of the Vinyl Fuse into a seam since there is a possibility of the fusible coming away from the fabric. Since this is for use in the bathroom and there is always a possibility of water on the floor, it would have been nice. On the other hand, I can always make a new one if this one gets nasty, especially now that I know how easy it is. I put this in the tote bag hashtag basket. 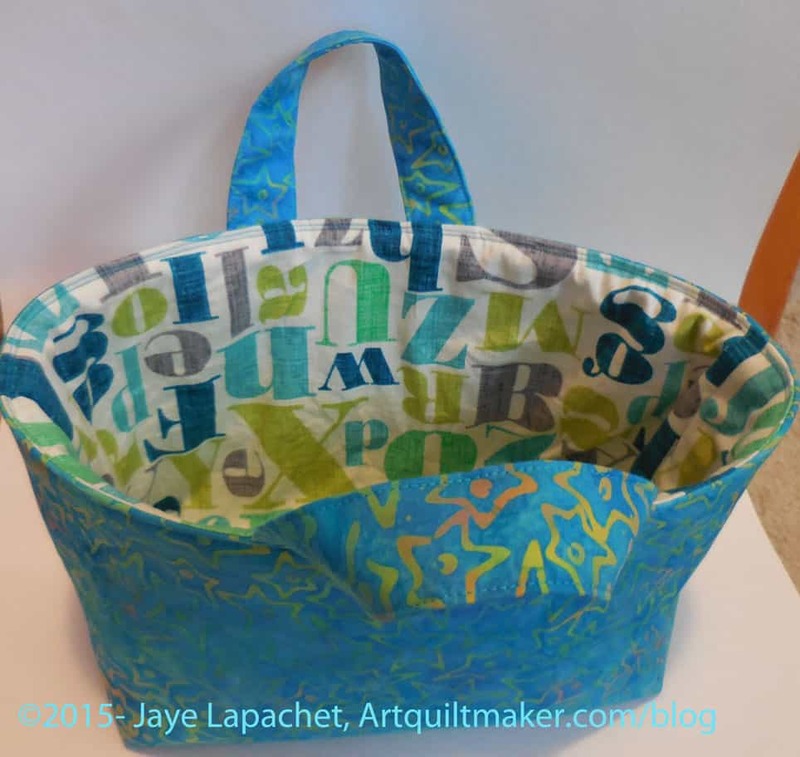 I am not sure it is really a tote bag, but I don’t have a basket tag and I am not about to make one at this moment. 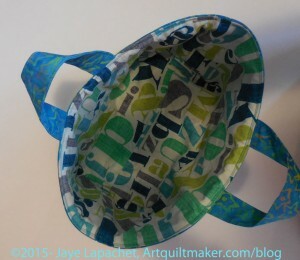 I may make a few more of these, but not tons, so into the ‘tote bag’ hashtag bucket it goes. I can’t tell you how thrilled I am with this project. Getting the TPoff the floor has been on my list for an eternity. Finally! Yay! Tanesha over at CraftyGardenMom website and podcast made one of these. I love the fabrics she chose! Pam at Hip to be a Square podcast made one as well. We live in a house called a Doelger House. It is split level and very open plan. That means we have a railing in the hall that is open to our living room. After I ran out of space in the Fabric Closet, where I hang quilts, I started draping them over this railing. Basically the photo shows one area of my house and how we display quilts. Recently we had dinner guests and they wanted a quilt show. We pulled quilts off of the chairs, couch and rail in our living room and held up many, many quilts.It was really fun to see some quilts I hadn’t pulled out in a long time. It is also always interesting to hear the reaction of people who really don’t sew or make quilts. My friend, also a law librarian, commented on how different the quilts were and what a lot of creativity was involved. My thought was “if I was allowed to use this creativity to solve problems at work, my library and information services would be way more awesome than they are.” I don’t know where that popped from but it was kind of a revelation. Lesson? 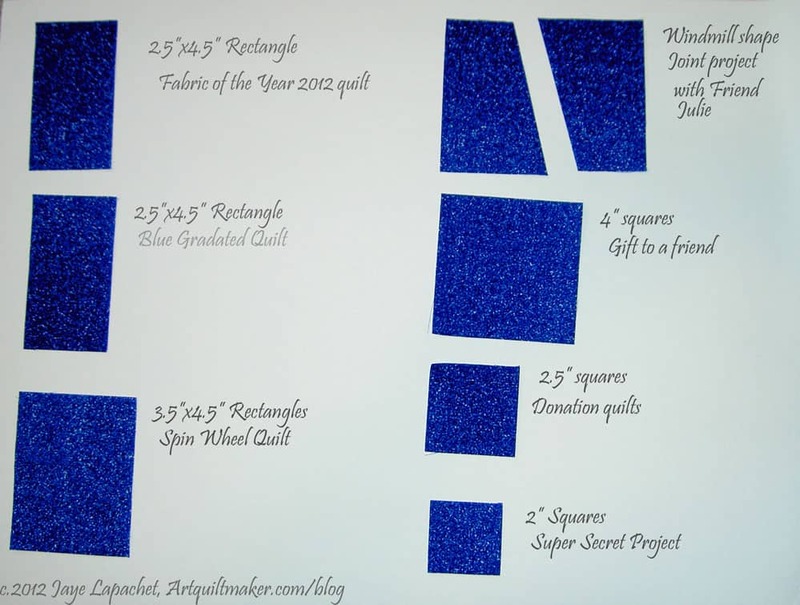 Show your quilts to non-quiltmakers! As you have seen on this block I make a lot of quilts. I do give some away, but a lot of them just pile up around the house. They get used as nap quilts or TV watching quilts, but mostly they just pile up. Some of you may think that is a big waste, but making the quilts really keeps me sane and able to live with people. I actually have at least two quilts that I need to send off as gifts; I just need to spend a little time wrapping and packaging and writing notes. I just haven’t done it yet. In various books I have read, especially set in Edwardian England, a Rag Man has been mentioned. This person, presumably not always a man, came around and collected scraps of cloth, clothes to worn to use any more, bits of fabric too small for quilts, etc. That is all I know and I have to say that I have longed for a way to get rid of fabric (not quilt fabric! ), items made of fabric that are no good for the various charities that take clothes and linens. I just hate tossing them and thinking of this perfectly good fabric, once cleaned and shredded and reused for …what? Something no doubt — ending up in a landfill. Sadly, no such person is forthcoming. I was thinking of my mythical Rag Man last Friday when I tried to cram some recently washed socks into an overflowing sock drawer. I thought of him again two minutes later when I tried to do the same with some undergarments. That was it. I took everything out of the drawers, both sock and undergarments, one at a time, and sorted the good from the bad, then reorganized the drawers. In the process, I found some handkerchiefs with the brown spots that come from fabric touching wood. I decided that I would line the couple of drawers I was cleaning out. As an aside, I like a clean and tidy house, but I am much happier when someone else lines the drawers and cupboards. As I moved to this house when the Young Man was six months old, and I was more concerned about keeping the tiny being alive than lining the drawers, the drawers of my dresser were never lined. Pretty soon, I was cutting a rectangle of the fabric for my underwear drawer and glue sticking it directly to the wood of the drawer. Probably not the ‘right’ way to do it, but since the interior designer had the day off, I went ahead. The sock drawer was next and a giant pile of singles and knee socks went out. I put some more of the Mod Century print down to line the drawer, put the revitalized socks back in an order that surely only makes sense to me and felt very pleased with myself. We have a lot of house projects to do. There is a long out of date list somewhere that is overwhelming to me every time I come across it. I have decided that one drawer is good. One shelf makes progress. Getting rid of three blouses that have not been worn since 2004 creates space and lightness and that is all good. I don’t have to clean out the entire closet at a go. Incremental or iterative progress is good. I spent a happy hour last week in my workroom after dinner trying to get a handle on the un-ironed fabric that is causing havoc in my workroom. I feel like I have been ironing fabric forever. I know that is why many of you don’t pre-wash your fabric. Trust me, if it weren’t for the smell of burning chemicals when I press, I’d be right there with you. Still, I found a couple of pillowcase bodies that I had cut who knows when. I cut a couple of pieces of Lizzy House Pearl Bracelets dark green for the cuffs and pinned together a couple of pieces of fabric that will be pillowcases soon. Yes, I am using up some precious Lizzy House Pearl Bracelets. Frankly, I have enough fabric and my fabric is currently overwhelming me, so it is a good use. Also, that green went really well with the taco and burrito fabric I had previously cut for the body of the pillowcase. The above two paragraphs are a precursor to my post-Star Sampler idea. I don’t know if it will work, but I am going to try to work through some small projects and patterns for bags, etc. 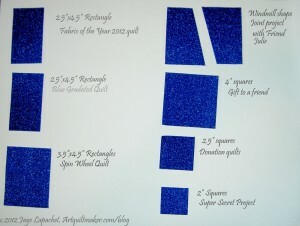 Of course, there are quilts on the 26 Projects list that I want/need to finish, so I will work on those. Also, I have bought a number of pieces of fabric for specific small craft items such as pillowcases. I want to get those sewn and out the door. 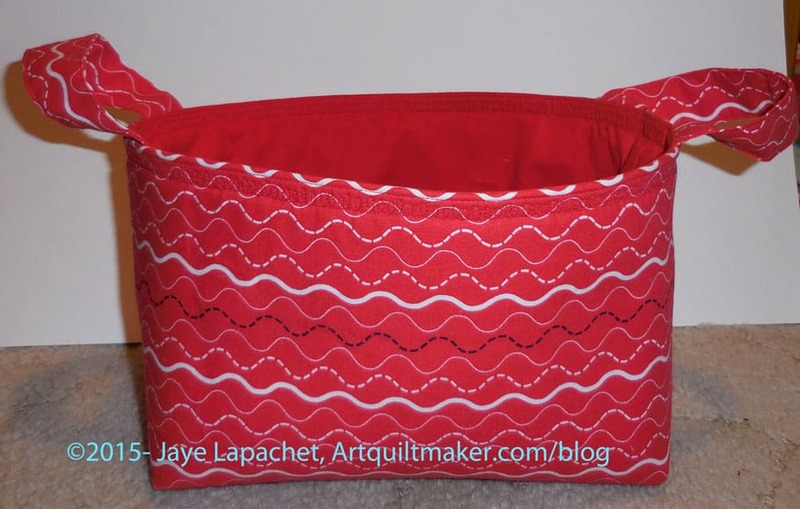 I also have patterns and some fabric for other projects such as bags. 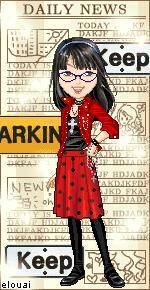 I want to make another Petrillo bag. I need more journal covers. I am thinking that I am going to take some time and work on these types of projects. I am going to try, at least. I may sneak some leaders and enders for charity quilts in, but that is my idea. Sometime ago I wrote a generic post about organization in my workroom. My workroom is somewhat organized considering it isn’t large enough and I don’t have enough bookcases. 90% of the time I can find what I need and I am less and less surprised by things I come upon serendipitously. One of the major things I do is, what I call, hunting and gathering. I prefer to make quilts, usually, that use a lot of fabrics. I think many different aquas will be more interesting than just one. This means that many projects, I need to cut a lot of patches from a wide variety of fabrics. 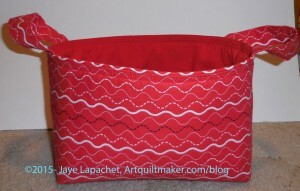 It doesn’t work for me to decide to start such a project, open up a fabric bin and start cutting. I can’t stand that long, I get bored and the whole situation results in me hating the project or just stopping about halfway through. Also, if I use that strategy, I get tend to have too many of one color and not enough of others. None of this is good for my stress level and definitely not they way I want my quiltmaking to be. Also, I don’t know of a way to really randomize this type of fabric selection. Cutting from fabrics I buy new or pull out to use seems like as good a way as any. Also, as an added bonus, I use fabrics that I like right now immediately. Another problem I had was that I would take fabrics out of bins and NOTHING would be cut from them. Not one square or anything. Shameful! This problem was alleviated by the Fabric of the Year project, which TFQ thought up and I ran with. 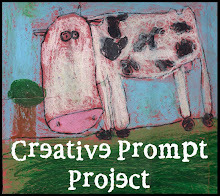 You can read about the beginnings of that project for me in a post from 2008. Doing this kind of started the solution to my Hunting and Gathering. As I got use to cutting one shape, the Fabric of the Year shape, out of new fabrics, it became easier to cut more than one shape. I thought it was a good idea and it became easier to use this new system to make progress on projects I was not yet ready to start sewing. Pretty soon I was up to the number of pieces I am cutting now. The other thing is that the fabrics became less precious. I started not to save them for a better project. I also knew, which I have talked about in terms of the FOTY projects, that I knew which fabrics were going to work for other projects so I could go and buy more before it was 3 years later and too late to go and buy more. 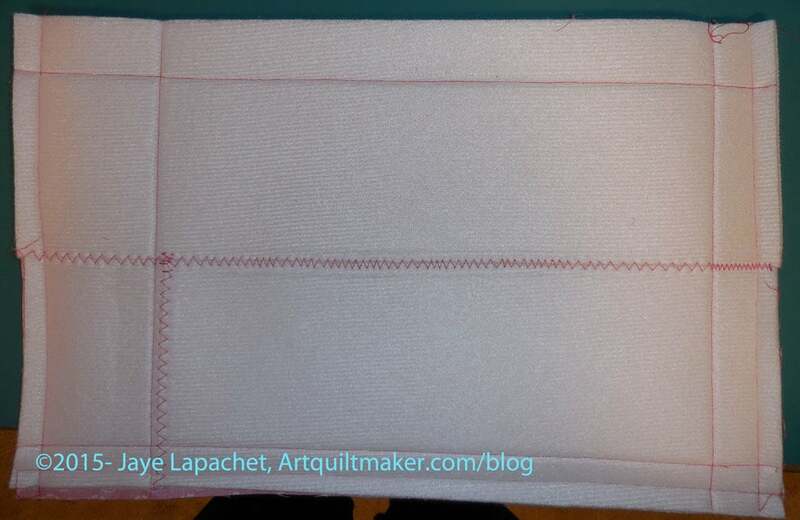 In addition to the above I also cut 2.5″x4.5″ pink rectangles, 2″ red squares and 2″ aqua or turquoise squares. 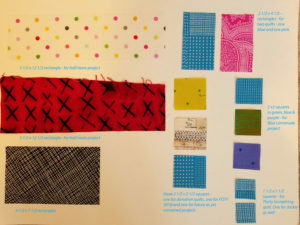 The idea is that after I identify a project I want to make that requires a ton of cutting, I figure out what kind of cutting I need to do (coordinated fabrics or scrappy fabrics as well as size). Either can work with my system. Then I put the shape and color on my list. I keep the list near my cutting table so when I have a new piece of fabric (after washing and ironing) I know exactly what to cut. By now I have a sense of how much fabric these shapes will need (now approximately 5″x18″) and I know by the size of the hole in the fabric whether I am finished. The bonus result of this cutting is that fabrics became less precious to me. 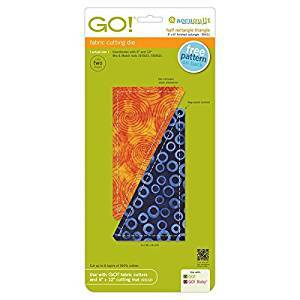 There are many fewer fabrics that are free from any kind of cutting. I make progress on projects that require a lot of cutting and I get to see new fabrics appear in projects I was making immediately. 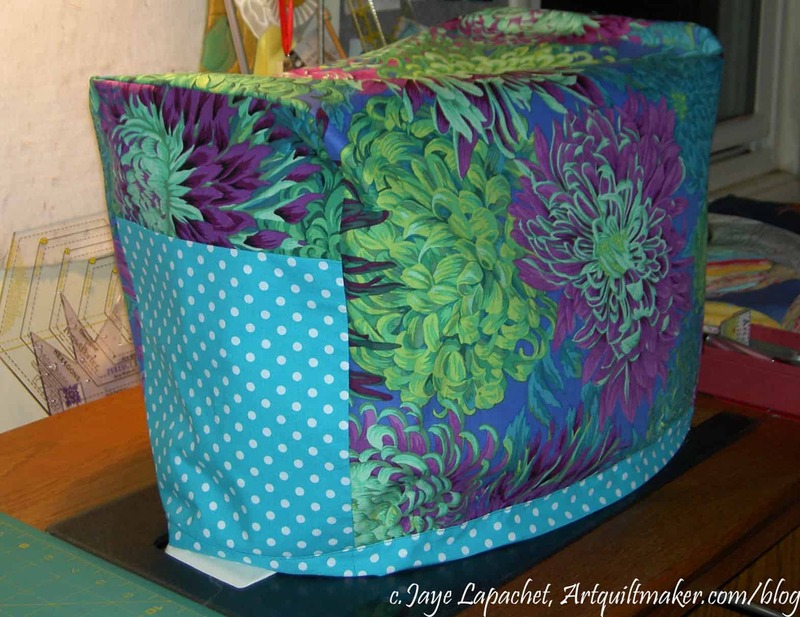 I have been thinking (and, perhaps, also talking about) making a cover for my sewing machine for a long time. Last Friday was the day! I took one extra day off work and made the long weekend really long. I got a ton done and was able to rest a bit. I didn’t feel so exhausted when I went back to work. 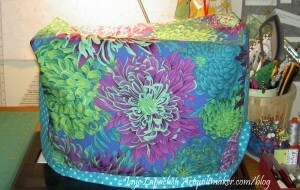 I buy some large pieces of fabric if I think I will make a bag from the fabric. I don’t like piecing together bits and pieces to make a bag. The Philip Jacobs Japanese Chrysanthemum print I used was one such piece. I was going to make a bag, but I really like it and thought I wouldn’t mind looking at it all the time as a sewing machine cover. I used a pattern from Strawberry Patches. I had a hard time understanding the pattern, so I also printed the post where she talked about making the cozy and showed pictures. The pattern is fine; my brain just didn’t understand how to make the thing without pictures. I do appreciate people posting tutorials like this, which is part of the reason I post tutorials, too. Have you see the AQ Tutorials? Someday I’ll optimize them for printing. The pattern provides measurements for some Bernina machines, but also tells the maker how to measure your own machine, which is what I did. The one thing I should have done is compared the measurements for the lining and the outside. The author suggests that you do those measurements separately, but I think they need to be similar in size. Mine were similar, but not exactly the same and I found the outside was larger once I was ready to sew the lining to the outside. I put some tucks in it, which I wouldn’t do for a gift, but I consider it a lesson for the future. I am not sure why the author had pockets on the pattern, but I put them in. 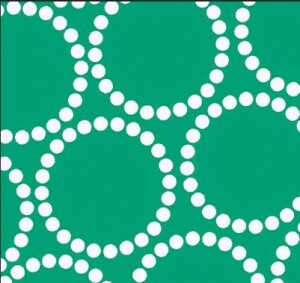 The Michael Miller turquoise dot makes me happy. Now I can keep the dust off my machine.